Mazda are adding two new models to the CX-5 compact SUV lineup in a response to customer feedback. The SE-L Lux and SE-L Lux Nav, available in showrooms now priced from £24,495 and £25,195 respectively, are based on the 2.2litre diesel 150ps 2WD SE-L, with manual transmission. Both feature a powered tilt-and-slide glass sunroof, full leather trim in Black or Stone, a six-way power adjustable driver’s seat and heated front seats. Peter Allibon, Sales Director of Mazda UK, said: “Many potential Mazda customers have expressed an interest in being able to acquire a CX-5 with a sunroof and leather trim without having to purchase a range-topping Sport model. “Now, responding to that latent demand, we are adding two models to our Mazda CX-5 range, based on our most popular and economical powertrain – the 2.2-litre diesel 150ps with 2WD and six-speed manual transmission. “The premium is an extremely modest £1,200 for an upgraded specification which would cost more than £2,500 with some rival brands. 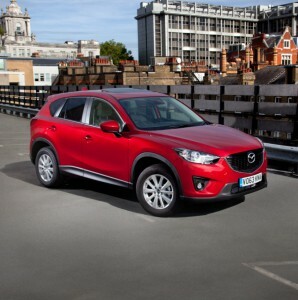 The 20-strong line-up of Mazda CX-5 models is priced from £21,595 to £29,395. Customers can choose petrol or diesel engines, manual or automatic transmissions and two-wheel drive (2WD) or all-wheel drive (AWD) – depending on model. CO2 emissions start at 119g/km with fuel economy up to 61.4mpg.